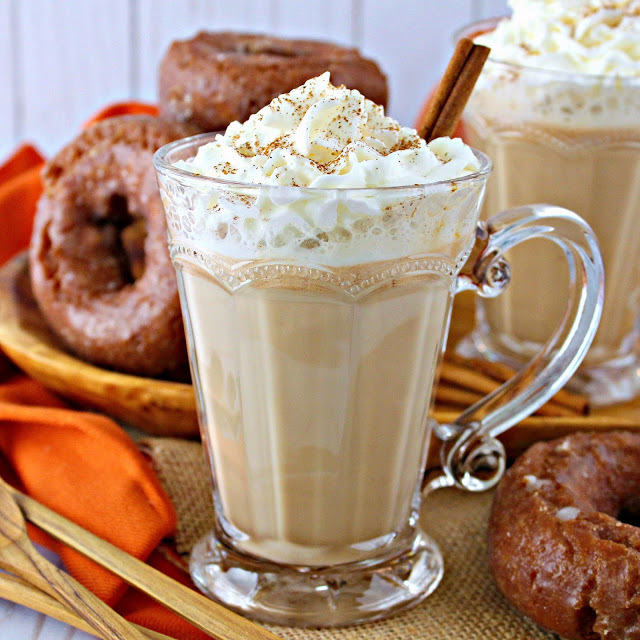 Enjoy all the flavors of your favorite coffee shop drink in the comfort of your own home with this Easy Copycat Pumpkin Spiced Latte. Real pumpkin and warm spices combine to create an espresso drink that any barista would be proud of. This post is made in partnership with Dixie Crystals. All opinions are my own. Fall is being celebrated in most of the country, and some cooler temps – high 70s!! – even reached Florida. When it dips below 80 degrees, everyone flocks to the coffee shop for their Fall favorite drink, the pumpkin spiced latte. While I love coffee shops, I don’t love the price tag that comes with the quintessential pumpkin drink. 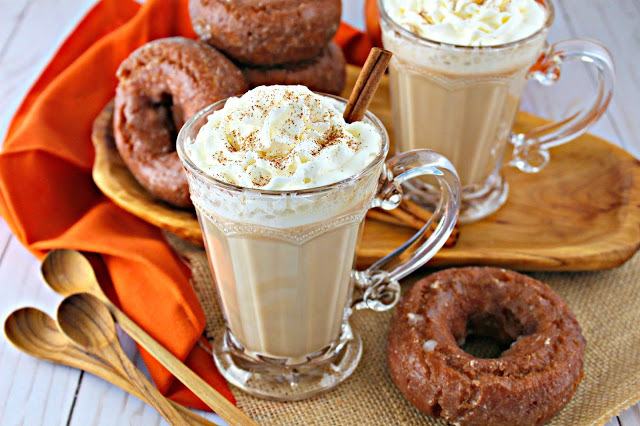 So instead of waiting in the drive-thru on your way to work, I created an easy, copycat pumpkin spiced latte that you can make at home! 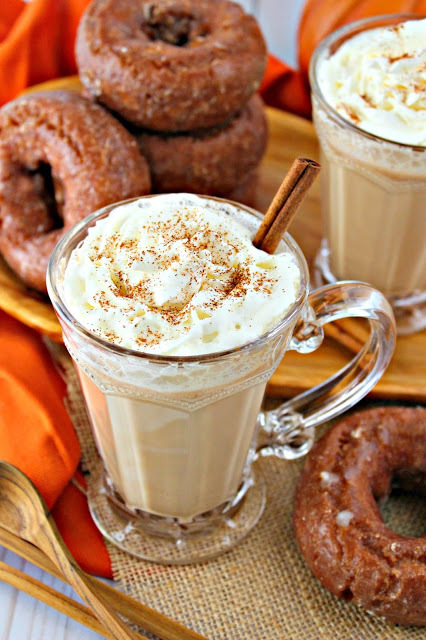 This copycat pumpkin spiced latte uses real pumpkin too! A pumpkin syrup is mixed with steamed milk and espresso, just like your coffee shop favorite. 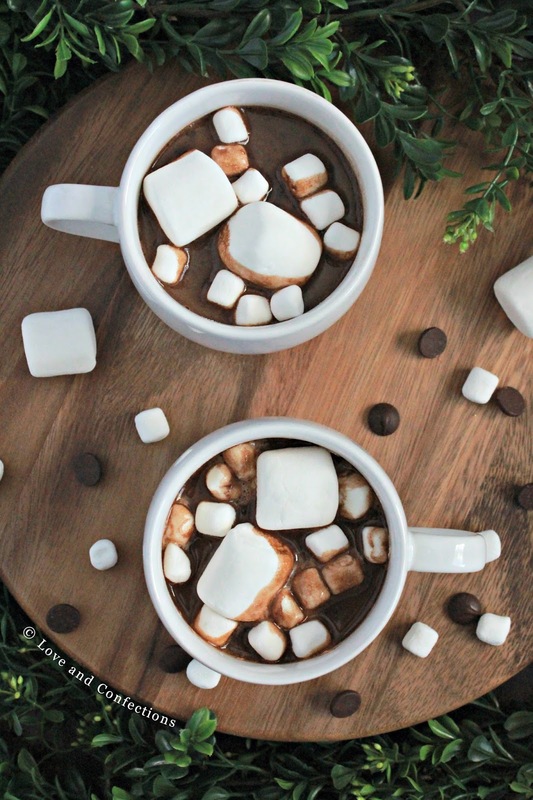 I love when the weather cools down enough to have a warm beverages like hot chocolate and apple cider. My pumpkin spice sauce used in the copycat pumpkin spiced latte can easily be doubled or tripled, depending on how many lattes you want for the week. You can whip up a batch and have it ready in the refrigerator, so minimal prep is needed in the mornings or for an afternoon pick-me-up. I also learned a neat trick when creating my pumpkin spiced latte. I don’t have a fancy coffee-make or wand that whips up the steamed milk, but I do have a high-powered blender! Of course, as with all hot liquids, be careful and make sure the lid is on tight. My blender whipped the hot milk to frothy perfection and gave me a beautiful foam for the top of the latte. I cannot wait to create more foamy lattes! I hope you enjoy this easy coffeehouse copycat recipe as much as I do. When the weather heats up, cool down with an easy homemade pineapple lemonade. This recipe can easily be doubled for your Summer parties and barbecues. 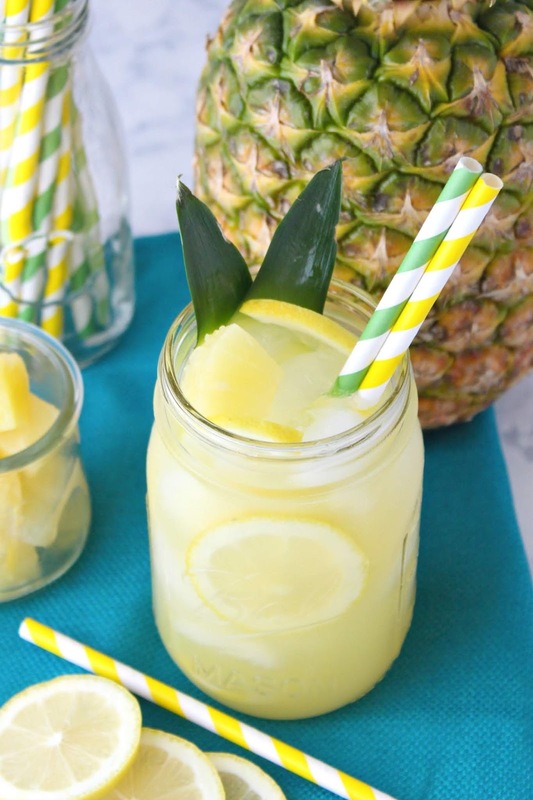 Grab your cocktail umbrellas, because you can also enhance the recipe with vodka for an adults-only twist. 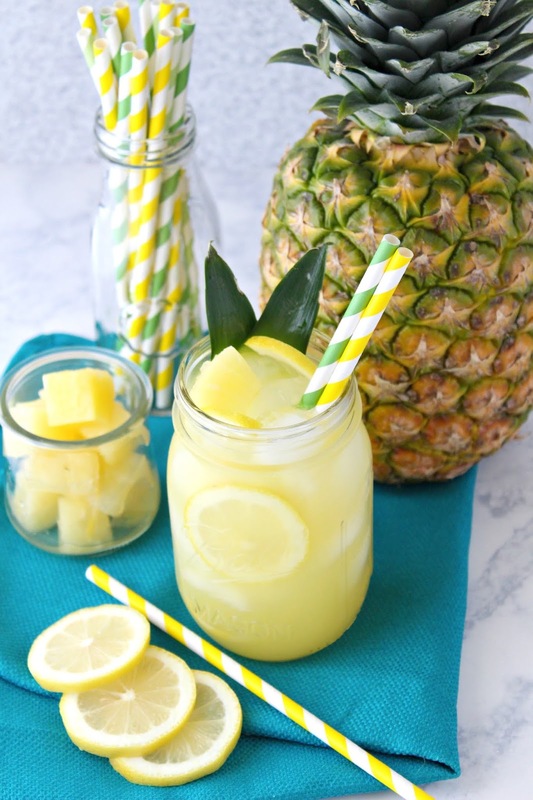 Simple Southern Pineapple Lemonade is the ultimate Summer beverage! 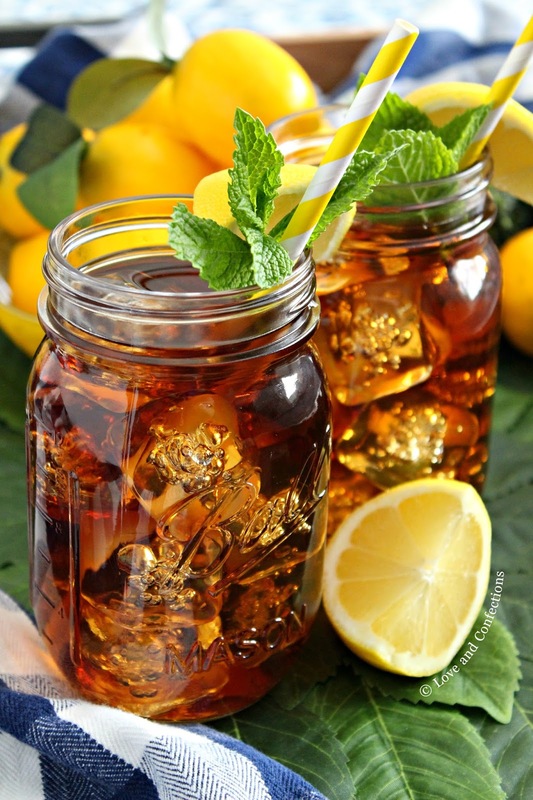 Aside from sweet tea, lemonade is one of my favorite drinks. There are so many delicious flavor combinations and sweet pineapple pairs perfectly with the tart lemons. This is the drink I grab when the afternoon showers roll in. The warm weather we have been having lately has been almost miserable. Our only reprieve is the afternoon storms. I have to run my errands earlier in the day, because we will inevitably get rained on later. Running around with a 4 year old in stormy weather is not on the top of my to-do list, so I pay close attention to the radar. 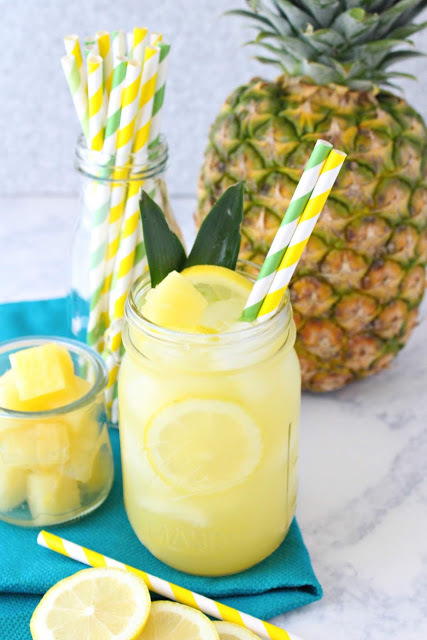 Pineapple lemonade is great to have on hand while watching the rain clouds roll in. Here, when it rains, the temperature usually drops 10 or more degrees. Since I am in one of the higher parts of Florida, we also get a good breeze, especially when a storm hits. Sitting on the patio sipping a glass of lemonade is also a great way to end a warm day and watch the sun set. 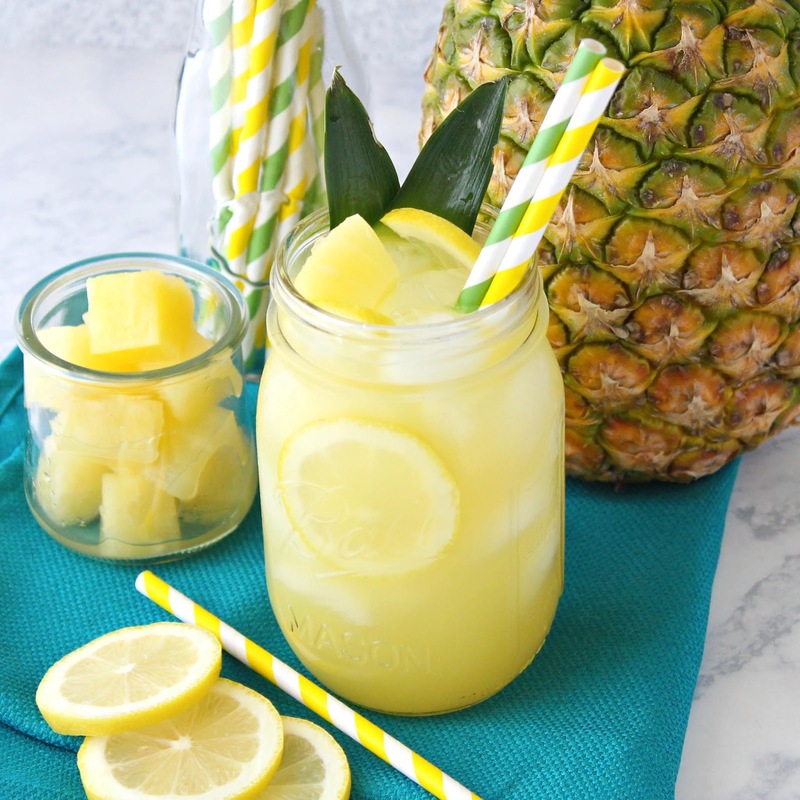 I love making a big pitcher of Pineapple Lemonade. 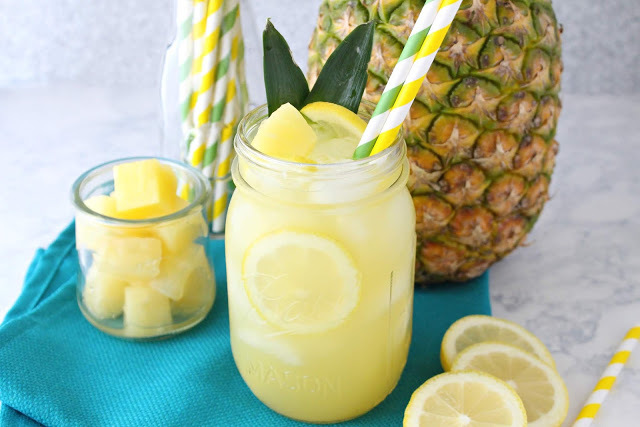 My little one and Mr. L&C both love lemonade and pineapple, so it comes as no surprise that they both love this combination too. I use a classic lemonade recipe then add pineapple juice and pineapple chunks for garnish. 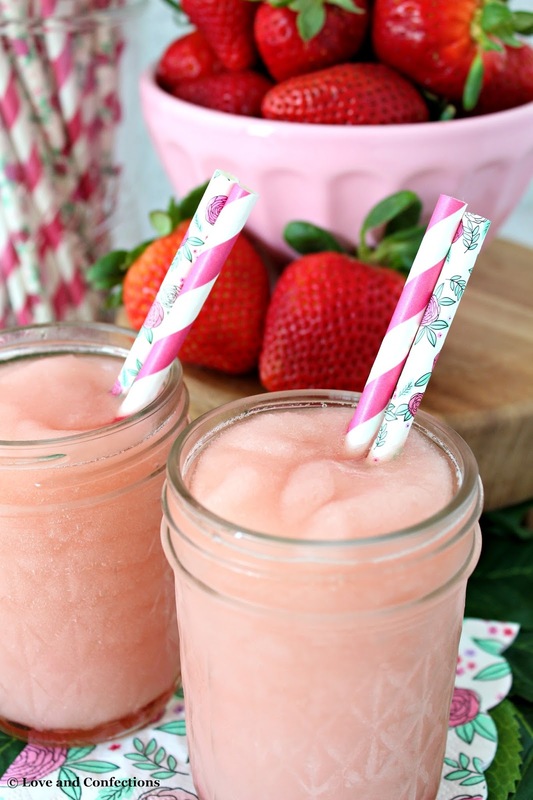 Easy Strawberry Frosé is a tasty boozy beverage that is sure to get any brunch, party or celebration started! Easy Strawberry Frosé combine a few of my favorite things: wine, the color pink, berries, and fun straws. I will totally admit that I love frozen cocktails, and this one could not be easier to make. Strawberry Frosés are perfect for any brunch, holiday, or girls’ night! I know my girlfriends would love to have appetizers and frosé during our next night out. 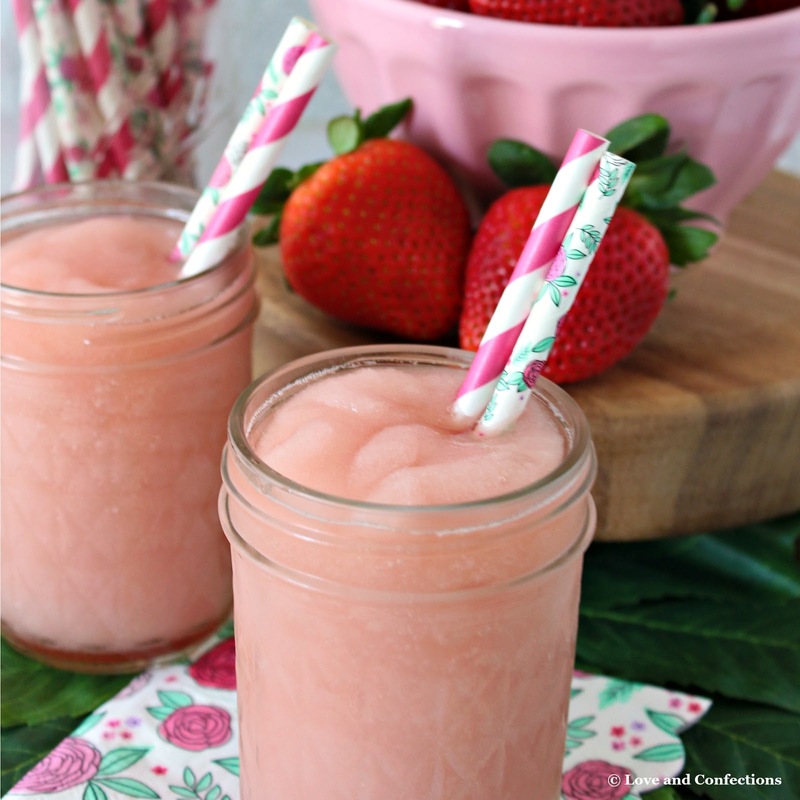 I love pink party drinks, and these would also be the perfect cocktail for Mother’s Day – especially with a pretty pink tablescape! You can’t forget the fun straws – I never do. I have so many straws it’s embarrassing, but I love them so much! You never know when you might have a spontaneous get-together and need some cute napkins or straws for cocktails. ‘Always be prepared and ready to party’ is my motto! When choosing a wine, take into account who will be drinking it. Do your friends tend to favor more dry or sweet wines. 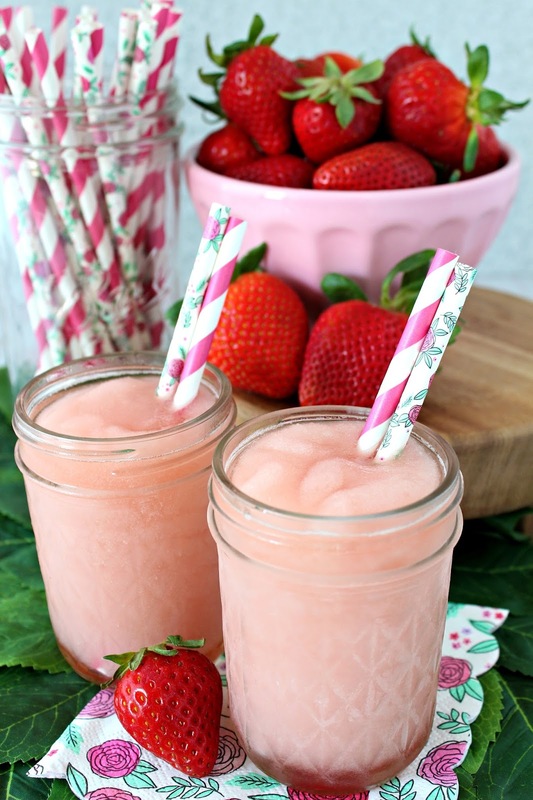 I chose a bottle that wasn’t too sweet, so I could add in my own strawberry simple syrup and adjust the sweetness. 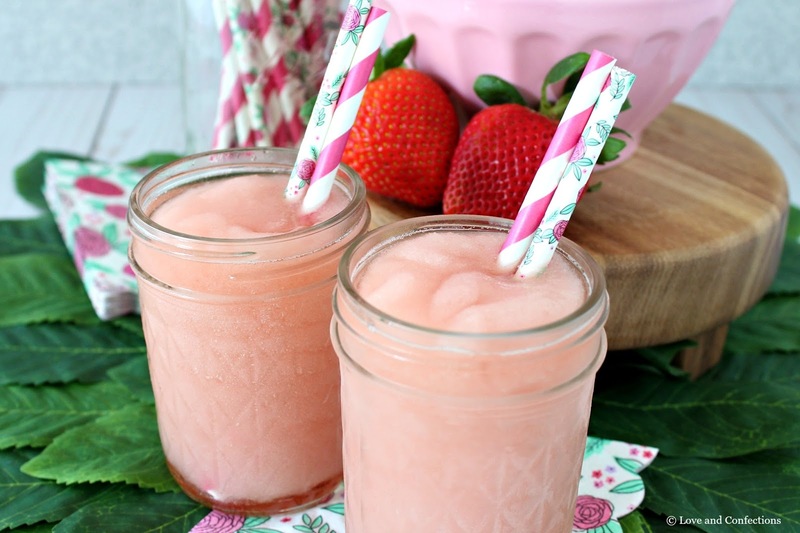 It helped make the drink perfectly pink, because the rosé lightens when it is frozen and blended. You will probably need to use 3 ice cube trays when freezing the wine. If necessary, the ice cubes can be made in batches the day before and kept in a freezer plastic bag until blending. It’s BrunchWeek – my favorite event of the year! I am so excited to be working with this year’s group of bloggers. We have over 150 amazing recipes over the next few days, as well as a big giveaway > enter here! I hope you enjoy all the fabulous recipes this week! Happy brunching! Freeze rosé in ice cube trays overnight. Antipasto Pizza from Strawberry Blondie Kitchen. 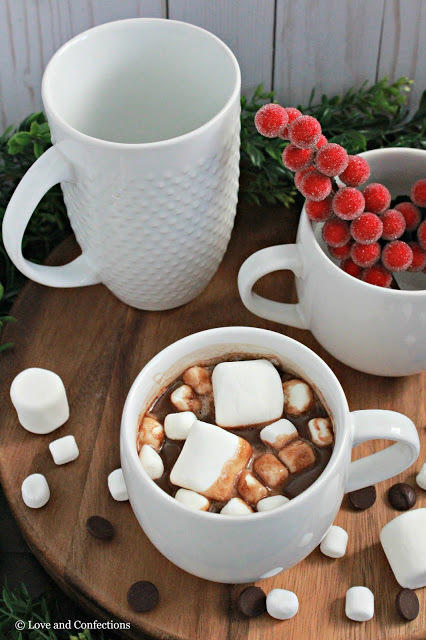 Hot chocolate for a crowd just got easier with the best slow cooker dark hot chocolate. With only a few ingredients, it will keep you warm and cozy on cold Winter days. This sponsored post is written on behalf of Florida Milk. All opinions are my own. Hot chocolate is one of my go-to cold weather drinks and I love sipping it on a cool Winter night in front of a fire pit. 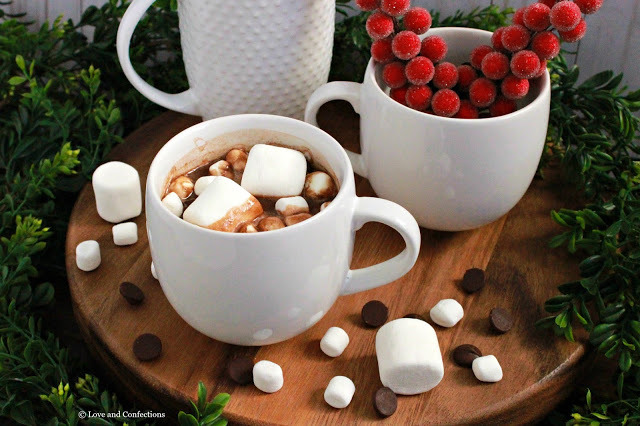 Instead of the prepackaged just-add-water version, I partnered with Florida Dairy Farmers to create a creamy and delicious slow cooker dark hot chocolate. My family loves dark chocolate, so using bittersweet chocolate chips made everyone happy. The key to the creaminess and richness is using whole milk and heavy cream, bittersweet chocolate, and sweetened condensed milk. There is no water in this hot chocolate recipe! When I drink hot chocolate, marshmallows are a necessary topping. Whipped cream is also a good choice, as are sprinkles, because everyone knows I love and hoard sprinkles. I also enjoy chocolate curls, chocolate sauce, salted caramel, or peppermint crumbles on top. 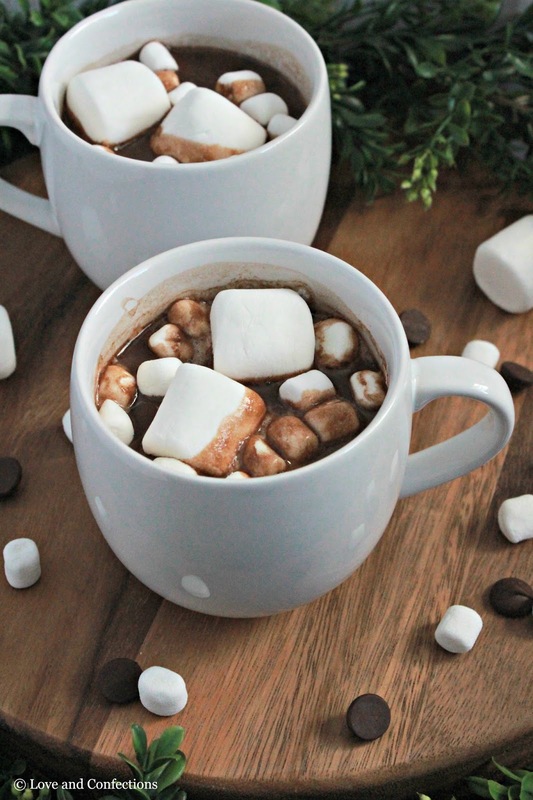 This recipe can easily be adapted for milk chocolate if you prefer a lighter tasting chocolate flavor, or add a little liqueur to make it an adult-only beverage. Here in Florida, we are just starting to get the cool Winter weather and it is beautiful! Holiday parties are starting to happen almost every weekend, especially cookie exchanges and ugly sweater parties. 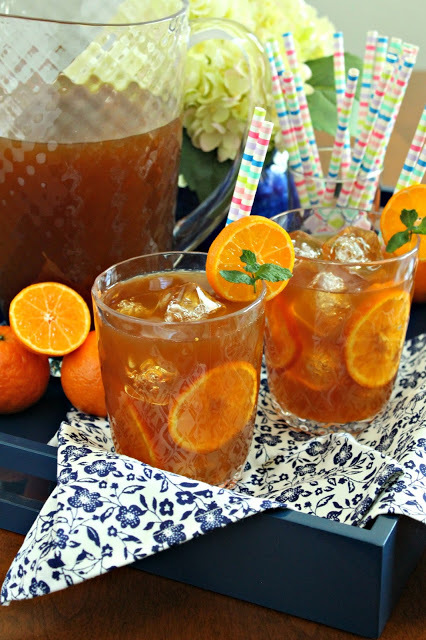 I love party prep, but to make it a bit easier I rely on my slow cooker for delicious party drinks. After pouring all the ingredients into the slow cooker, it heats on low for around 2 hours. I usually whisk it at the beginning, middle and end to make sure all the chocolate pieces and cocoa are melted and incorporated. You can use your slow cooker’s warming feature after the 2 hours, or just keep it on low for the party, but it is best served right away and please follow proper food safety rules. For more great recipes and inspiration, visit Florida Dairy Farmers on Facebook, Instagram, Pinterest, Twitter and YouTube. Stir together the chocolate, sweetened condensed milk, whole milk, whipping cream, vanilla, cocoa if using, and salt in a 6 quart slow cooker. Cover and cook on low for 2 hours, whisking occasionally until mixture is hot and chocolate chips are melted. 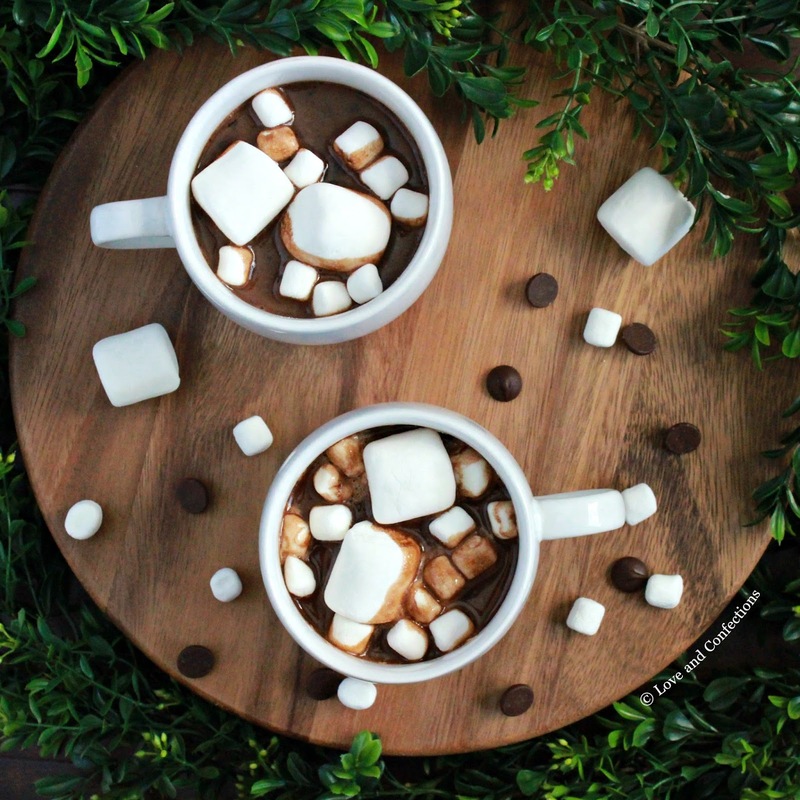 Serve and top with marshmallows or whipped cream. Prep Time: 0 hrs. 05 mins. Disclaimer: I have an ongoing relationship with Florida Dairy Farmers as a recipe developer. Thank you for supporting the brands that make Love and Confections possible. This post may contain Amazon Affiliate links – if you make a purchase after clicking the link, the price will not be higher, but a portion of the sale will go towards the sustainability of this website. As always, all opinions are my own. Made-from-scratch apple cider is the secret to this creamy and delicious Fall Drink. 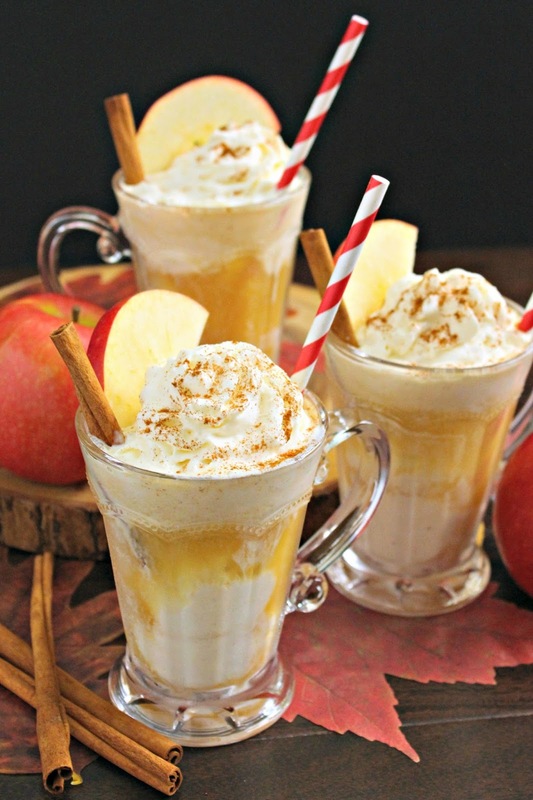 Homemade apple cider, vanilla ice cream and creme chantilly are just the right combination to sip on a crisp autumn day. It is officially Fall and I am excited about this season. Fall is probably my favorite of the four seasons, because of the changing leaves and cooler temperatures. Granted, we don’t get that in Florida, so maybe that is why I love Autumn so much. There is something special about Fall; maybe it’s the weather, or the fun activities, but it is almost magical. 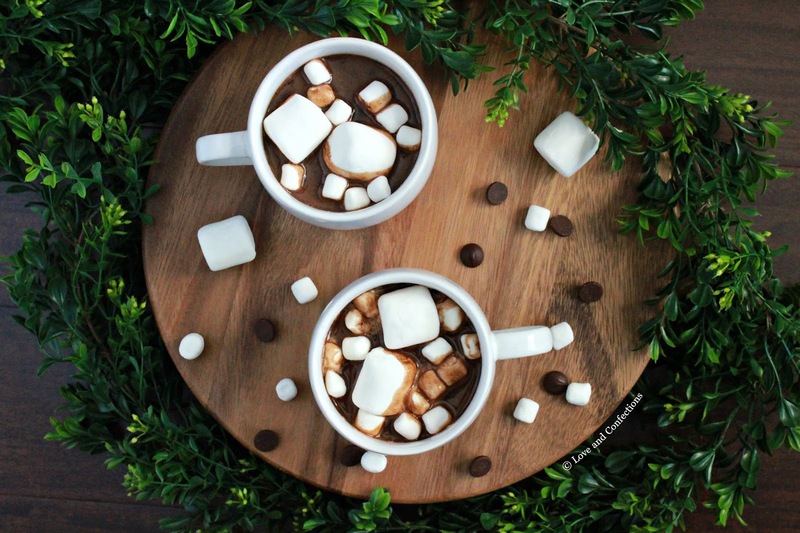 Pumpkins pop up everywhere, pumpkin spice everything, Fall festivals and corn mazes, getting ready for Halloween and Thanksgiving, and that feeling of change and excitement all come around this time of year. Apple picking is another quintessential Fall activity and I am almost bursting with excitement because I am finally going to go apple picking for the first time next week. For many Northerners, visiting apple orchards are a regular Fall activity, but for this Southern Florida girl apple picking garners way more excitement than usual. I love going to orchards and farms to pick fruits and vegetables and have never been far enough North, and able to pick, during apple season. I am definitely going to bring back some apples from my trip, and cannot wait to make more homemade apple cider. The warm, delicious smell that wafts through the house while making cider is amazing. Pair it with freshly churned vanilla bean ice cream for an extra special Fall treat. Cheers! 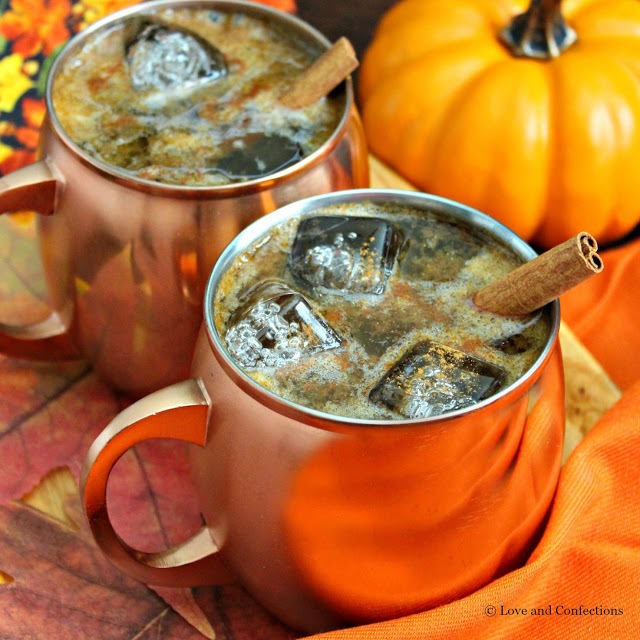 Celebrate Fall with a Pumpkin Pie Moscow Mule – my twist on the classic cocktail with pumpkin and warm Autumn spices! Welcome to #PumpkinWeek 2017!! 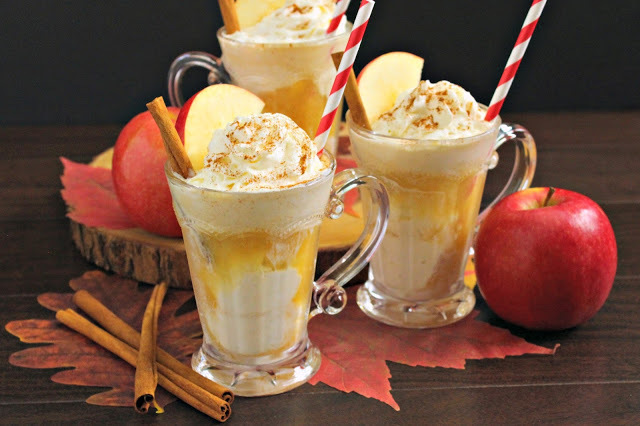 I can’t believe what started as a small gathering of bloggers wanting to celebrate their love of this fabulous Fall flavor has turned into such a great event year after year. What started off with 17 bloggers and 65 recipes has turned into 35 bloggers and 105 recipes, 4 years later. 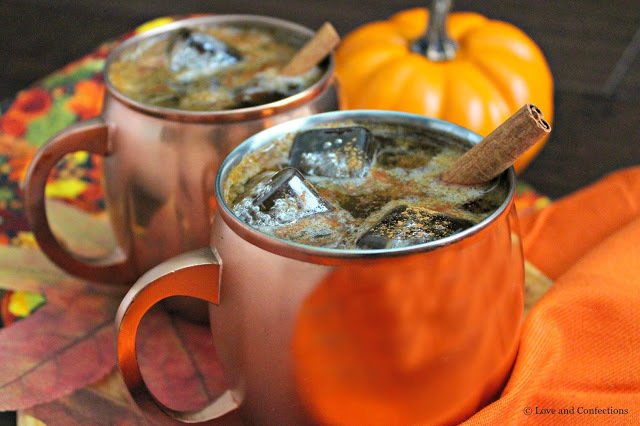 As usual, I like to start off my week-long celebrations with a cocktail, and this Pumpkin Pie Moscow Mule does not disappoint! Within the past couple of years, I have jumped on the Mule bandwagon. Aside from the fact that drinking out of a copper mug is awesome, I really do love all the flavors in it. 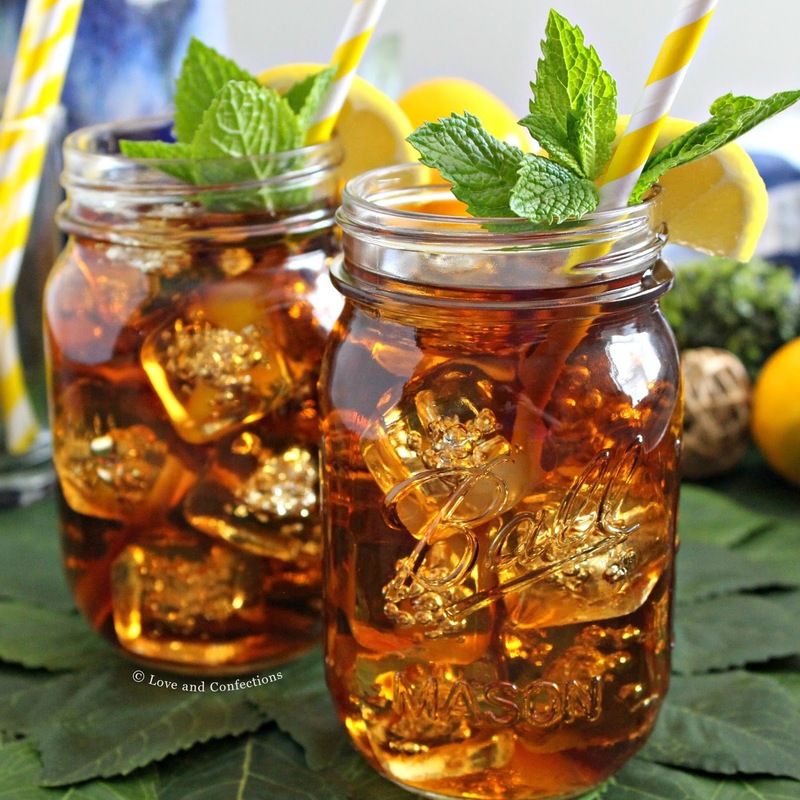 Now, sometimes they are a bit more gingery or limey depending on the recipe or bartender, but since it is quite different than my usual fruity/sweet cocktail order, I like to try them at restaurants or bars. This recipe does not use lime, but the ginger beer I used had a hint of lime. It’s all about personal preference, and this recipe can easily be made for two or to serve a crowd. 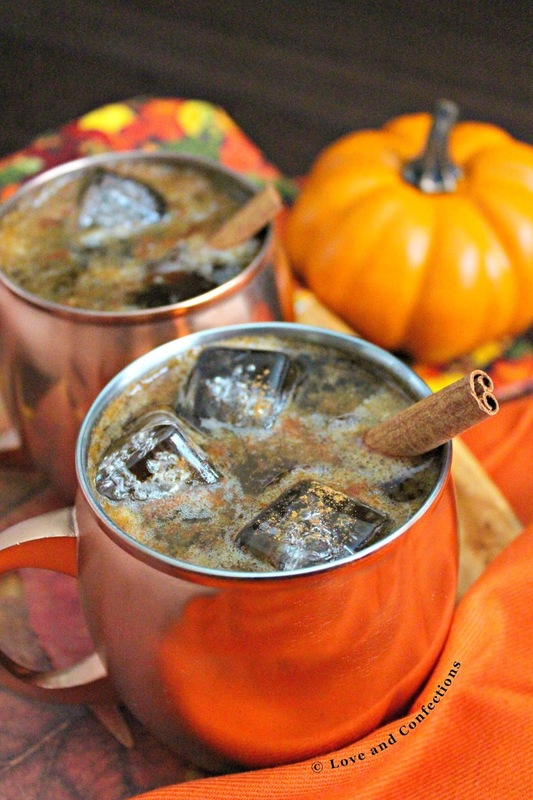 The Pumpkin Pie Simple Syrup is enough for quite a few drinks. I am actually saving some for another pumpkin-inspired cocktail coming soon. I started the syrup with both granulated and dark brown sugars. The rich molasses flavor from the dark brown sugar complements the spices, but I also didn’t want it to be too overbearing. 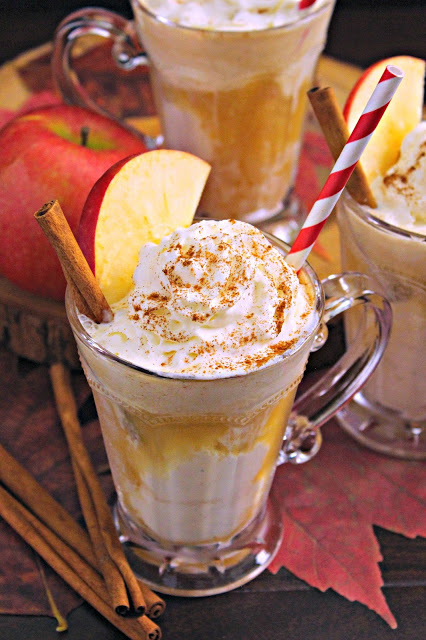 When mixed together, the whole drink is warming and delicious. 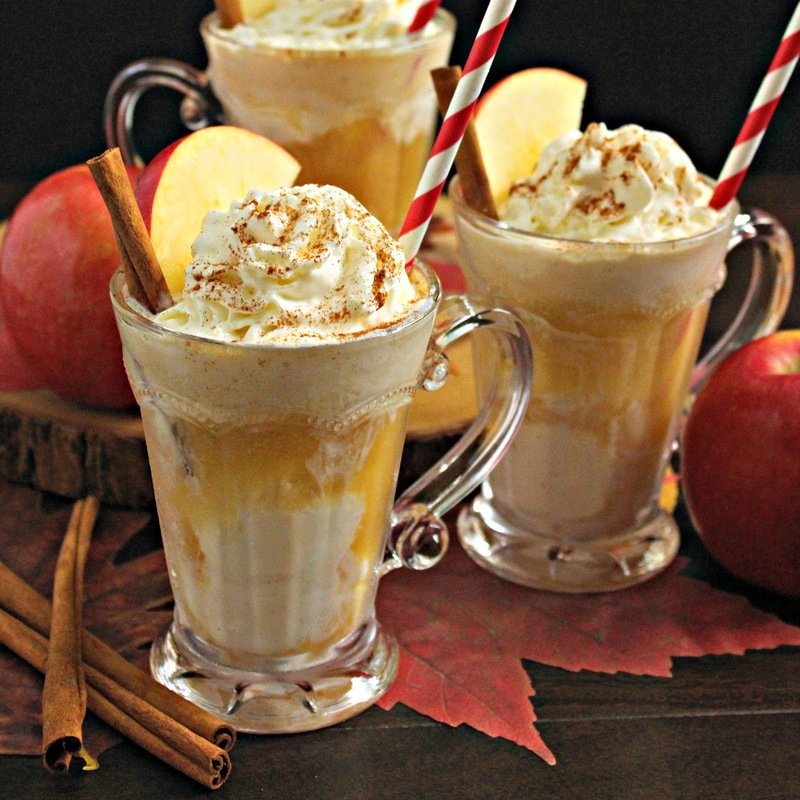 You can probably even use a flavored vodka (caramel, pumpkin, or apple pie) or to really give it a punch, some bourbon. 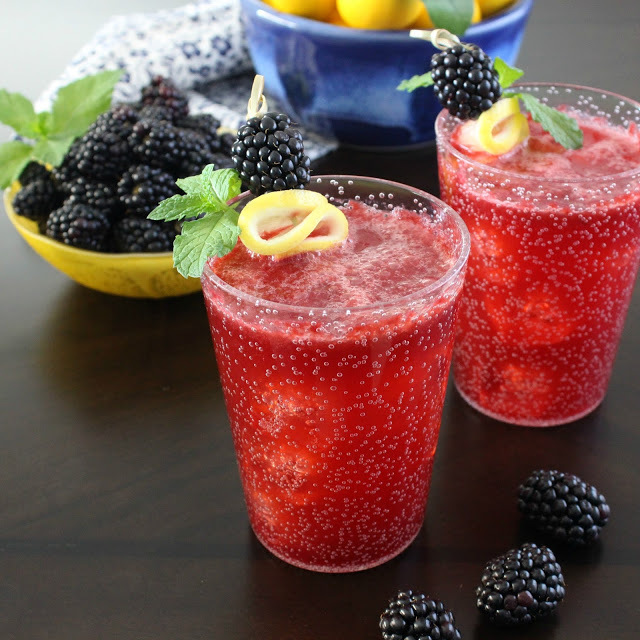 I love playing around with different flavor Moscow Mules, and even created a Berry Basil Moscow Mule this past Summer. October has me craving pumpkin, apple, cinnamon, nutmeg, and all those lovely warm spices that feel like Fall. 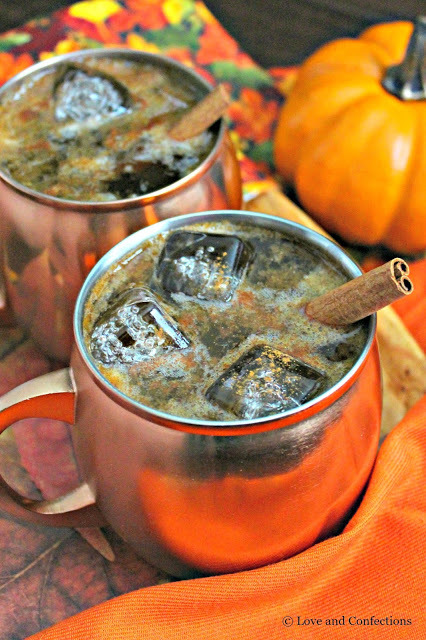 Since it isn’t quite sweater-weather yet, I am definitely enjoying this Moscow Mule that is cool, refreshing, and tastes like Fall in a glass. Cheers! In a medium saucepan, combine water, sugars, pumpkin, spices and vanilla bean paste. Heat until sugars have dissolved. Set aside for 10 minutes. Discard cinnamon sticks. 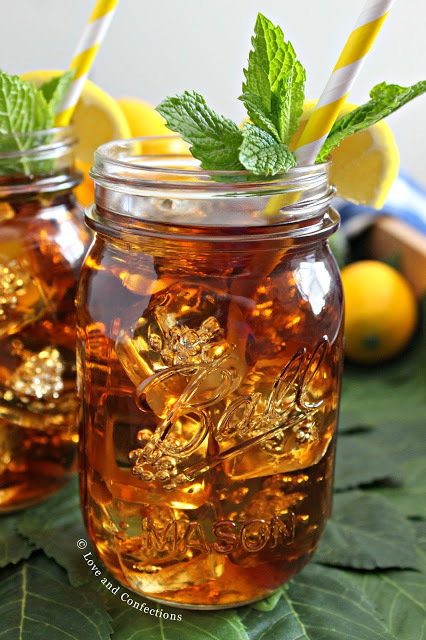 Pour syrup into heat-safe container and refrigerate until chilled. 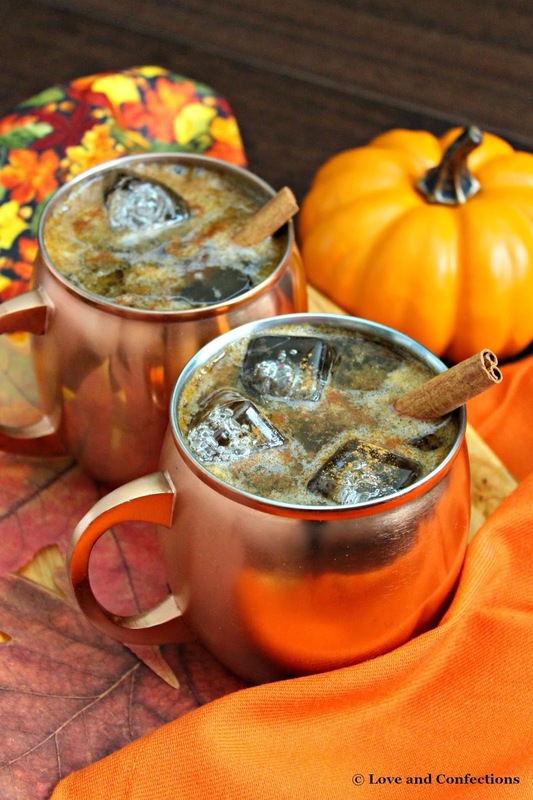 Once syrup is chilled, in cocktail shaker or measuring cup, combine 2 ounces pumpkin syrup and 2 ounces vodka per serving. Divide between glasses, top with ginger beer, and garnish with cinnamon stick. 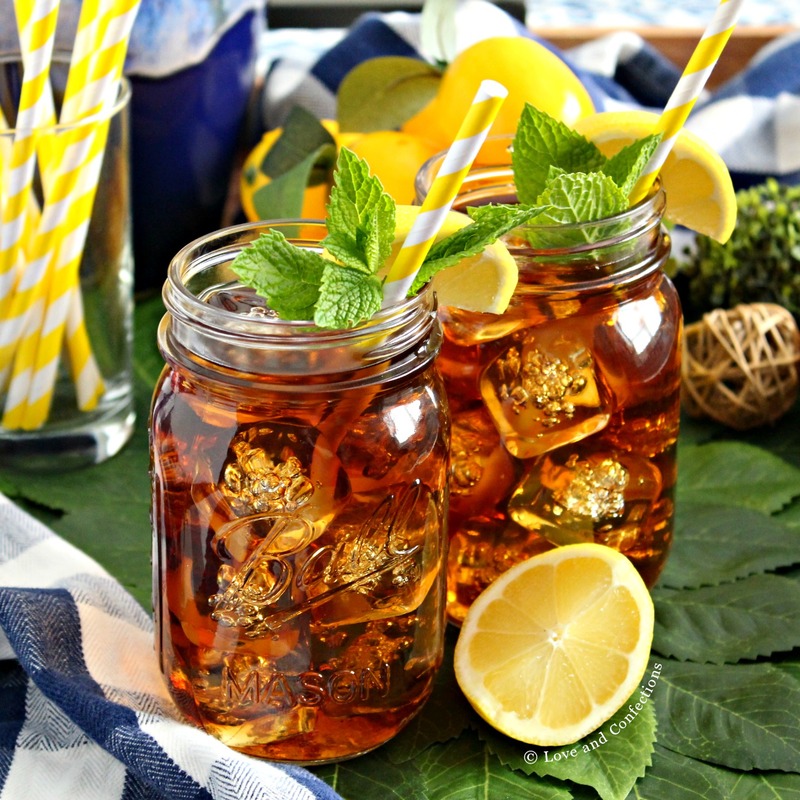 Sweet tea is a staple in the South, and I am a Southern girl at heart. Give me biscuits, gravy and a tall glass of sweet tea and I am a happy girl! 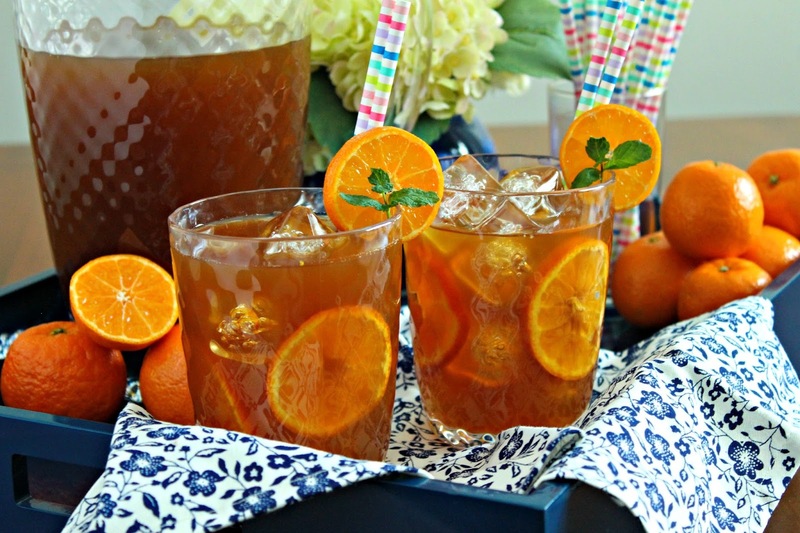 Traditional sweet tea is given a refreshing fruity twist with tangerine juice. Being from Florida, we have a lot of beautiful citrus available and adding fruity flavors to drinks is always fun. Depending on the fruit, tangerines can be sweet or slightly tart. I created a sort of tangerine syrup with tangerine juice and sugar, to sweeten my tea. If you can’t find fresh tangerines, check the refrigerated juice section of your grocery store for tangerine juice. If that isn’t available, clementines and oranges are other good options. 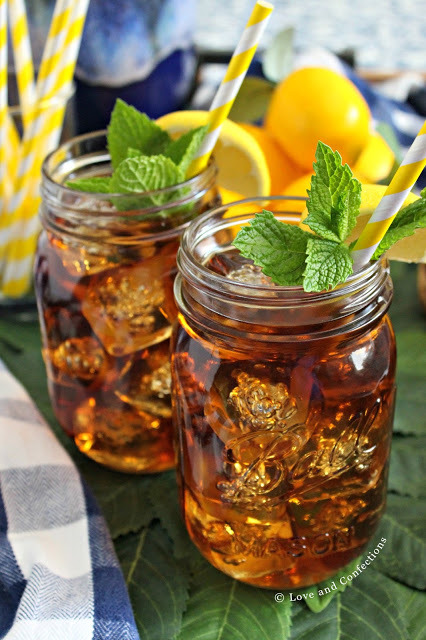 Don’t forget to garnish with some fresh citrus slices, mint and fun straws. I have a large collection of straws that I am always adding to. I find them in craft stores, party stores and online. 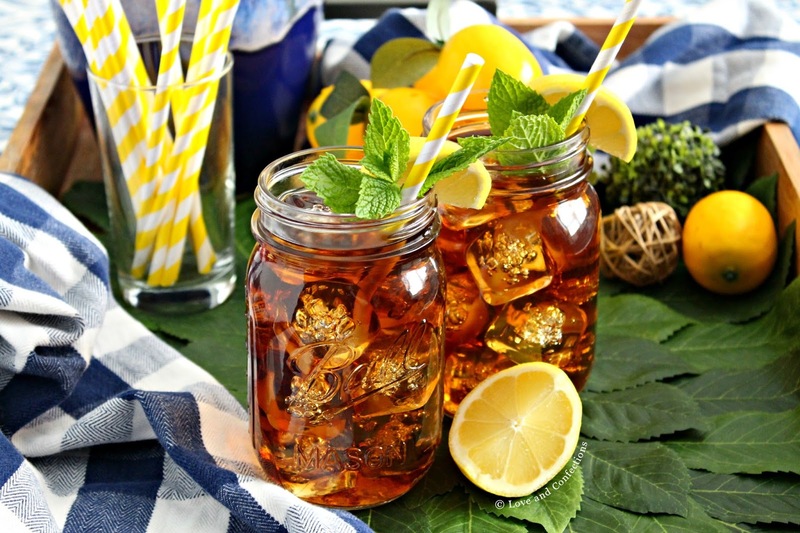 I think they really make a festive drink display and are great for parties or cocktail bars too. 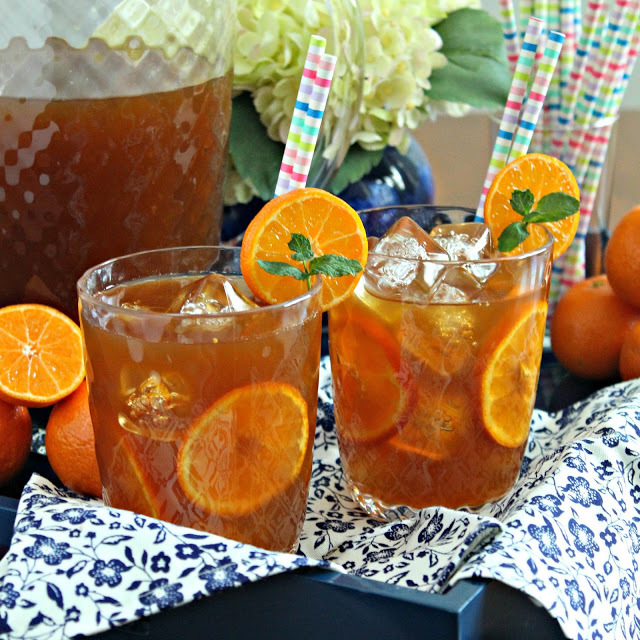 Hope you have a delightful day and have a glass of Tangerine Sweet Tea to sip on. Cheers! 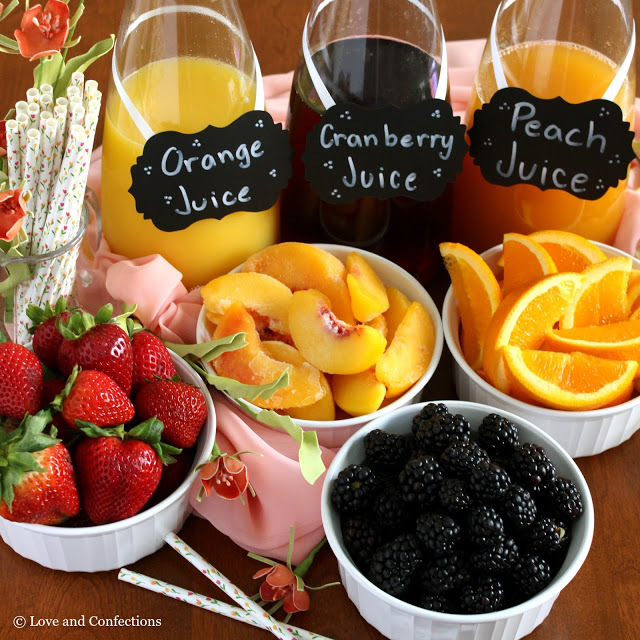 Mimosas are my requirement for brunch and my homemade mimosa bar is sure to steal the show! When I brunch, I love having mimosas. 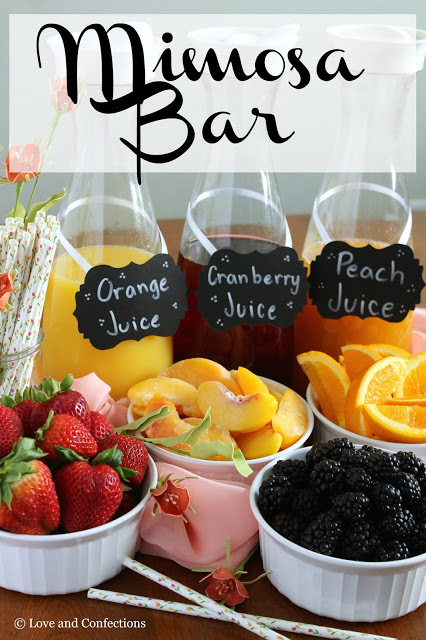 Endless mimosas are great when I brunch out, but mimosa bars at home are even better. 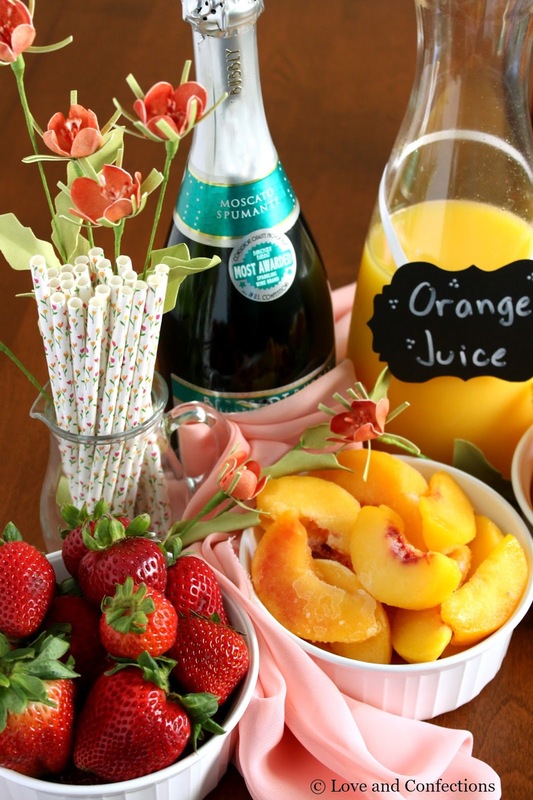 I love having options to pair with champagne, and mimosa bars are the best way to please everybody. Welcome to the fifth annual #BrunchWeek hosted by Me – Love and Confections and Christie from A Kitchen Hoor’s Adventures. We are so excited to have you join us this year as we celebrate Brunch and prepare for Mother’s Day. Forty Bloggers from around the North America will showcase their best brunch dishes, from cocktails to cakes, danish, tarts, and pizzas – with 170 recipes, there is something for everyone! Our amazing Sponsors have donated some great prizes for the #BrunchWeek giveaway. My favorite flavors are “Flamingo” – orange juice, cranberry juice and champagne, pineapple juice and champagne, or peach juice and champagne. 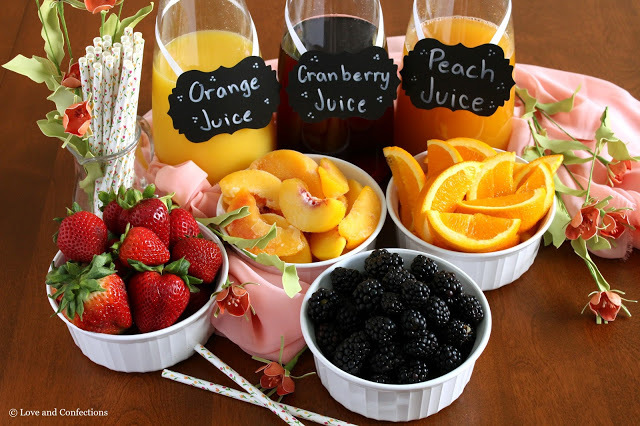 A variety of juices is key, as are a variety of fruit garnishes. I almost always have orange slices, berries, and peach slices. Any combination of fruit is guaranteed to look gorgeous. Whether you like champagne, prosecco, or any other variety of sparkling wine, make sure it is nicely chilled and you have enough on hand. I usually keep a few in a large ice bucket once my brunches start, and guests can help themselves. Glassware is important. I love champagne flutes, and prefer stemless for parties – I think it’s just easier both for display, ease of use and in cleaning. You can use real glass or nowadays get some pretty real looking plastic ones too. 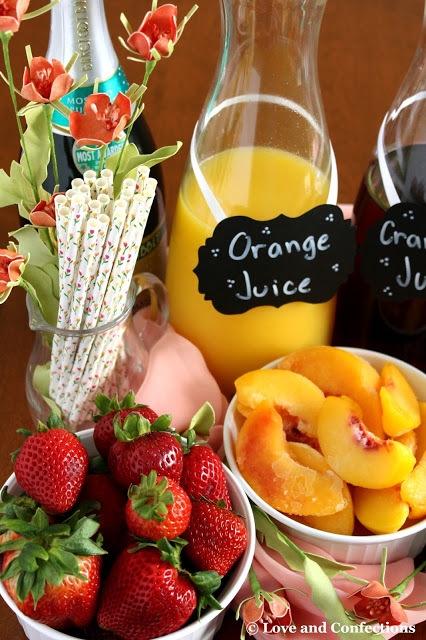 I always have fun straws on hand to add to my mimosa bar. Straws are a great way to tie in your theme or color scheme. Whichever you prefer, always keep it classy, and have fun! Place juices in easy to serve carafes. Chill bubbly and place in ice buckets. Arrange fruit in pretty bowls. 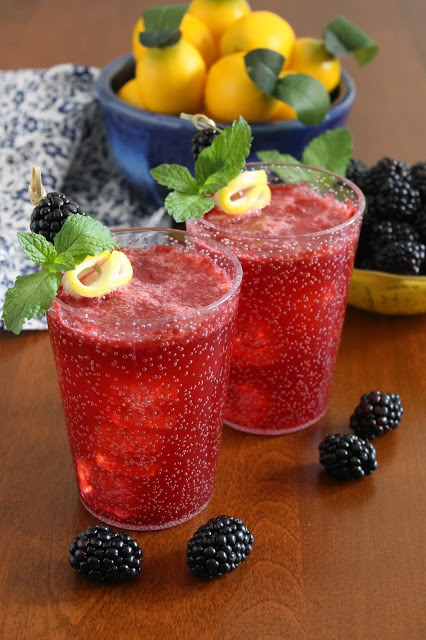 A refreshing cocktail with a berry-licious twist: blackberries, lemons, simple syrup, gin and ginger ale combine into a refreshing drink, perfect for happy hour or evening cocktail. It easily turns from a cocktail to a mocktail too! 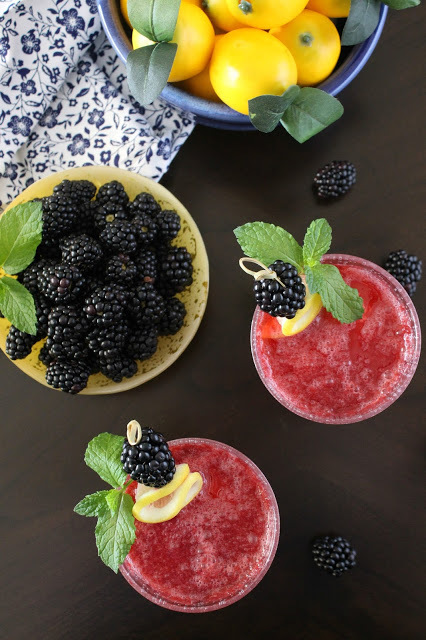 I love creating fun cocktails and this Bramble is one of my favorites so far. It has the perfect amount of sweet and tart, and incredibly easy to make. Blackberries are in season right now. The gorgeous, plump, and juicy berries are absolutely delicious and perfect for a Spring or Summer cocktail. My one pet-peeve about these gorgeous purple fruits are the seeds. I dislike any cocktail that has muddled blackberries and keeps the seeds in. To fix that, I used my food processor then strained the mixture so I had the wonderful blackberry flavor, without all the seeds. 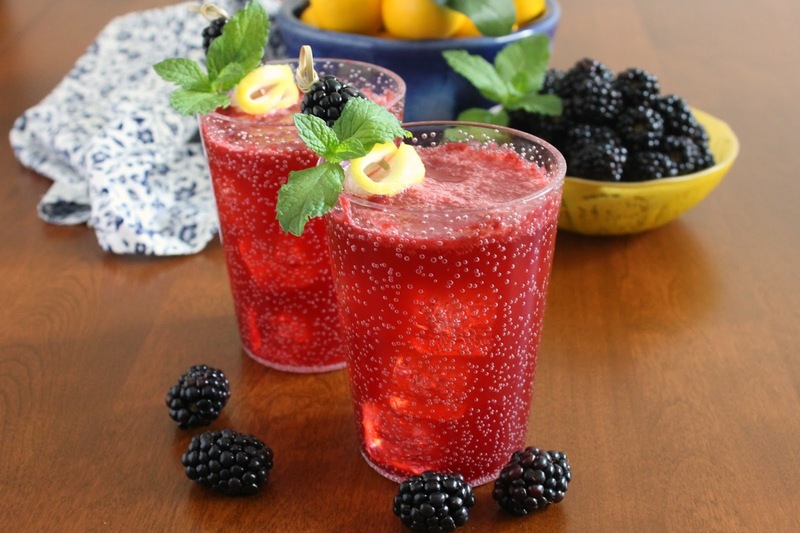 I can definitely imagine myself sitting on my patio, enjoying the Spring sunset, with a Blackberry Lemon Bramble in hand. Don’t forget some fun garnishes – because we eat with our eyes first. I am growing mint in my container garden at the moment and am loving the pop of color it gives. I also have an alternative if you or someone you know is not imbibing. The mocktail tastes just as delicious!